As frequent travelers, you’re probably already aware that traveling for work can be quite a grueling process. Even with the help of advancing technology, it’s still entirely possible for your phone to die on you, for your reservations to get entirely mixed-up, and even for your food to take the longest time to be served. However, this isn’t a reason for you to start despairing. 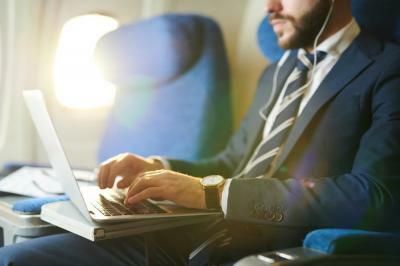 In fact, before you go on your next business trip, just take a look at some fantastic tips we’ve carefully selected just for you. These tips are not provided in order of importance. Even if you can’t even remember the last time you got sick, it’s always good to bring along a basic med and well-being kit. After all, you might not want to see a doctor at the drop of a hat, so having the necessities with you will really make your life a lot easier. You can’t control the number of bugs from others you come in contact with, so it’s always better to be safe than sorry when it comes to taking care of your health. Technology is great, but it also leaves us dependent on it, especially when it comes to reaching out to others. There is the possibility of losing your phone while traveling, so it’s a great idea to compile a list of important contacts to put in your suitcase. Nobody likes getting stuck with no idea how to contact people they know, so don’t let that be you on your next business trip. The madness of rushing from one place to another and joining in the hundreds and thousands rushing to and from at airports will take a toll on you. To give yourself the best chance to truly be effective, you should consider reaching a day earlier in order to relax and prepare. If not, you should at least avoid peak airport times such as Friday nights and Monday mornings. There’s nothing wrong with keeping yourself occupied, but if you’re always on the brink of burnout, you’ll want to take a step back to consider your lifestyle choices. Are you doing too much with too little time? It’s easy to get lost in a flurry of activity and forget that both our minds and bodies need to rest. Do yourself a favor and give yourself some time off if that’s what you need to rebound back stronger and healthier. Stress can’t be avoided during a business trip – when traveling for business, there are so many things that can disturb your peace – getting late to the airport due to heavy traffic, delays or cancelations, being away from your loved ones, bad or no Wi-Fi signal when you really have to catch up with your office team, poor accommodation, failing ill, or managing your itinerary, these are just some of the factors that can transform your trip into a nightmare. The secret is to keep calm and carry on in order to find the right solutions when no one is besides you to help. For business travelers, packing efficiently is a real skill. Packing for a business trip can be a struggle – you have to pack clothes according to the meetings and events you are going to join, but you also need clothes for your free time. Pack smart and bring versatile clothes that are comfortable and fit different occasions. This also goes for shoes as well. Try to choose fabrics that don’t wrinkle easily. Even if you have all the time in the world, the idea of being greeted by someone who’s already waiting to pick you up is a feeling we’ll all love to experience. With a limousine service pickup, you’ll be able to enjoy a truly comfortable ride. Just imagine how great it is now that you won’t have to hail a cab or pay insane rush hour rates anymore. Our Destin limo service is ready to serve you, night or day. We’re invested in your comfort and safety, and we take all precautions when it comes to our customers. We’ll love to have you on board with us to experience the meaning of true luxury. Nobody loves waiting in long lines and wondering where to go to get onto their shuttle bus, so do yourself a favor and get in touch with us today! We are ready to offer you’re the best car rental Panama City tourists and residents can rely on. Here, at 654LIMO, our commitment to offer traveling executives the first-class experience, top-notch management, friendly and professional chauffeurs, plus an exceptional fleet, everything at a competitive price, is unsurpassed throughout Northwest Florida. Our efficiency, excellence, and an unwavering commitment to providing VIP service set us apart from our competitors. The importance of privacy, efficiency, safety, comfort and time is valued and prioritized. We understand how important time is for business travelers. If you are not an experienced business traveler, that’s ok. Our team of professionals can assist you in every moment of your travel experience. We, at 654LIMO, have a clientele of Fortune 500 companies, but also small businesses – we treat everyone with equal respect and professionalism. Not to mention that absolute discretion is a cornerstone of our commitment to exceptional service. While you might not thing of using a reliable limo service for your next corporate trip, it is the best investment that you and your company can make in order to ensure that the entire business trip runs smoothly. Using an executive car service offered by 654LIMO allows you and your business partners to enjoy a safe and luxurious travel experience tailored according to your unique needs, without compromise. You can choose your desired vehicle from our state-of-the-art fleet of modern, luxurious cars.